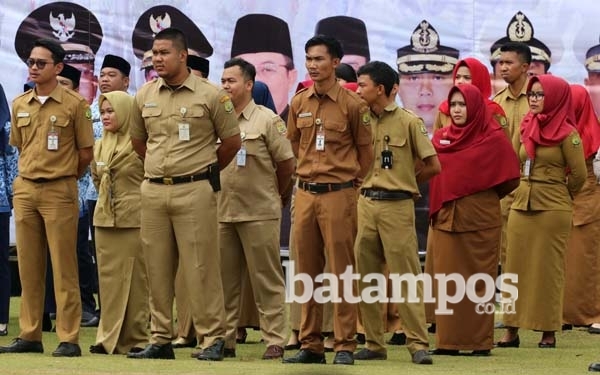 batampos.co.id – The state civil apparatus in the Tanjung Pinang City Government must be prepared with a new payroll system. Tanjungpinang Regional Secretary Rhino said, Tanjung Pinang Regional Secretary Riono said, as of 2019 a single payroll system will be carried out. The scheme in a single payroll system for ASN, explained Riono is to remove the components of the benefits that have been available so far. So that later ASN only receives basic salary, but the amount is enlarged. “In this scheme, child and wife allowances, rice allowances, and other benefits have been included all into components of basic salary,” explained Riono.